Hilarious. That comment somehow made me picture both "The Littlest Hobo" and original "Degrassi" all at the same time. Then I barfed in my mouth a little. Haha! We are glad you enjoyed that...sometimes it is frighteningly accurate description. Personally I don't mind Jalal Merhi that much, he was pretty good in Expect No Mercy and Expect To Die. This film was OK, but the third was better. And I didn't even realize it, but I was secretly begging for more Tiger Claws action. That said, I've always loved me some Bolo Yeung. Venom: He wasn't too bad in Expect No Mercy...gotta love the floating Merhi head. Haha. M. Brown: Thanks! 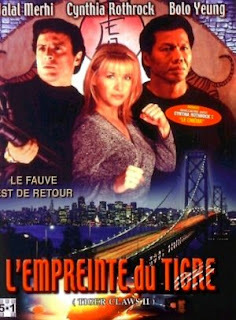 Have you've seen all THREE Tiger Claws movies? Because there are three of them. We've only seen this one to date. We love Bolo and Bronson too....they should have made a movie together.